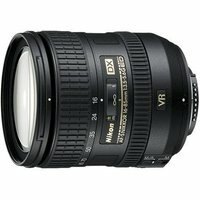 The Nikon 16-85mm f3.5-5.6G ED VR AF-S DX Nikkor Lens is a compact, lightweight, fully-featured zoom lens and is ideal for a wide range of shooting situations. It is ideally suited for use with compact Nikon digital SLR cameras with the smaller DX size chip. This lens offers the equivalent focal length in 35mm terms of 24-127.5mm. It will also conveniently cover everything from tight indoor portraits to medium telephoto shots.